Everyone welcome, particularly past and present residents from Ellastone, Stanton, Wootton, Ramsor and Calwich. Light refreshments and display of local historic photographs. Local villagers will be celebrating a very special milestone on Saturday 6th April. 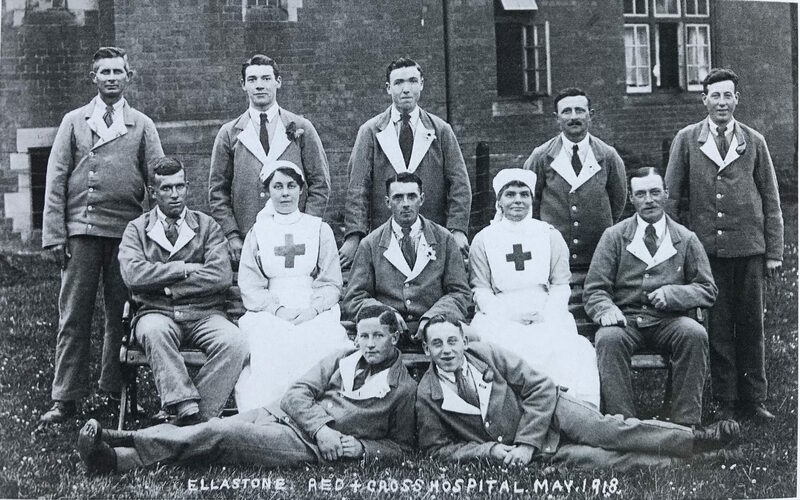 One hundred years ago the people of Ellastone had the Parish Hall returned to them after 5 years of service as a local auxiliary hospital during WW1. This special occasion is being marked with a ceremony to commemorate the moment when, on April 4th 1919, the Parish Hall was handed back by the Red Cross. One hundred years on the Hall will be hosting a special tea party for residents, past and present from Ellastone, Stanton, Wootton, Ramsor and Calwich. The Parish Hall committee are welcoming everyone to come and join them in celebrating the beautiful and historic building that is still at the heart of the community today. The Hall dates from 1910 and was given to the Parish by the local estate-owners, including Col. Bromley-Davenport of Wootton Hall, and Col. Bertram Heywood of Wootton Lodge. This fine building was the brainchild of Col. Heywood (also an architect), who donated half of the funds. 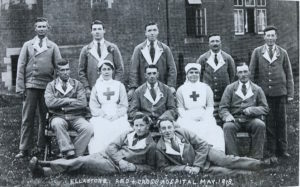 Within just four years war broke out, and it was transformed into an auxiliary hospital to care for wounded soldiers. 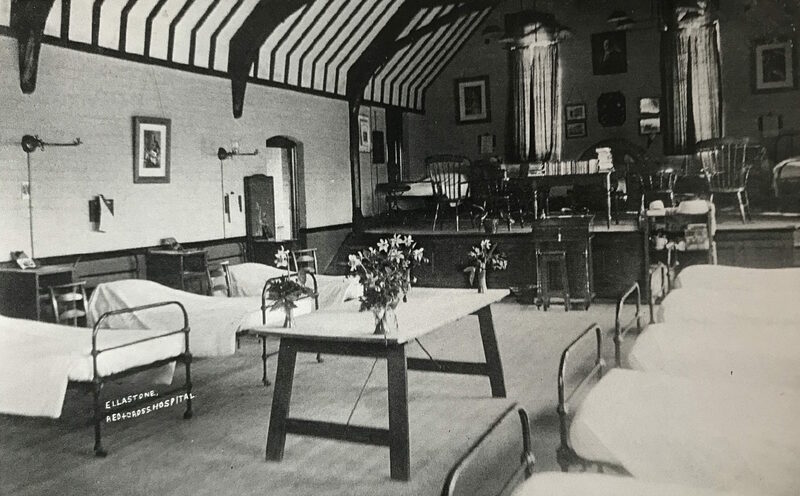 In total 345 injured servicemen were treated in the Hall during its time as a hospital, and whilst the war ended in 1918, treatment and convalescence continued until February 1919. 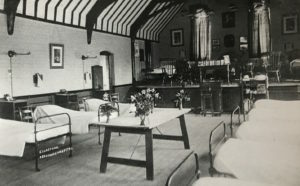 The Hall was finally handed back by the Red Cross in April 1919. When it was originally handed over by the Trustees in 1910 it was said to be one of the finest Parish Halls in the country. It was designed to encourage local people to meet up for social activities and stem the tide of people moving from villages into cities. Today the Hall is still at the heart of the community, with weekly classes in yoga, tai chi, painting and fitness, as well as regular social events, and is increasingly attracting users from further afield following recent modernisation and improvements including internet access. Everyone is welcome to join the centenary celebration on Saturday 6th April 10.30am to 12.30pm, particularly past and present residents from Ellastone, Stanton, Wootton, Ramsor and Calwich, and also past residents who grew up using the Hall. Light refreshments will be served, there will be displays of local historic photographs including the history of the Hall, and the celebrations will culminate in a handing over of the key ceremony by the Red Cross to a local community leader. The celebration event is free, and is hoped that those attending will make donations to the Red Cross. There will be a formal key handing-over ceremony at 12.00pm with local residents in WW1 Red Cross and period costumes.